The Delta IV-Heavy at lift-off on 11 Nov 2007. The Delta IV series of launchers was developed by Boeing during the late 1990s as part of the US Air Force's Evolved Expendable Launch Vehicle program. It is now manufactured and launched by the United Launch Alliance consortium. 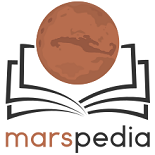 Several variants of the Delta IV exist in order to cater for a wide spectrum of civilian and military mission profiles; however, only the largest of these, the Delta IV Heavy would be of major interest for Mars mission planning. The Heavy configuration (pictured) uses three Common Booster Cores (CBC) in parallel as its first stage, each mounting a single Rocketdyne RS-68 hydrogen-oxygen engine. It has an LEO performance of approx. 23 tonnes, but this comes at a hefty price tag of between $250 million and $300 million per launch. Delta IV Heavy page at Astronautix. 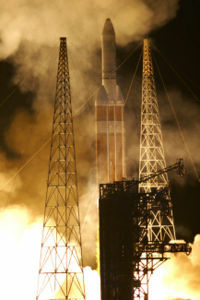 Universe Today news on the successful launch of Delta IV-Heavy on Nov. 11, 2007.